Osibisa Legend Gregg Kofi Brown Releases Autobiography & New CD Anthology "Rock 'n' Roll And UFOs"
London, UK - Gregg Kofi-Brown is best known for his work with seminal African funk rock pioneers Osibisa, who were one of the first, if not THE first African band to achieve popular success in the West. With conscience laden lyrics and funky afro-rhythms, Gregg has a created a multi-national musical platform with his guest artists that speaks to many people across the world. Gregg Kofi Brown was executive producer of the 2003 Evening Standard cover-mount CD give away in memory of Damilola Taylor which featured the likes of Robbie Williams, Craig David, Gorillaz, Blue and Ms.Dynamite. 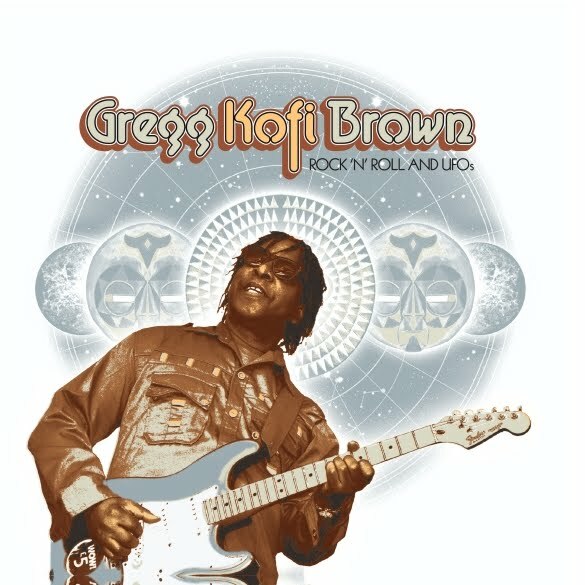 Gonzo Multimedia UK has just released Gregg Kofi Brown's “Rock 'n' Roll And UFOs” anthology and will be releasing his autobiography of the same title next month! Gregg Kofi Brown has transcended many genres of music...from his ongoing collaborations with jazz drummer supreme Billy Cobham, to performing as guest guitarist with World music guitar legend Bombino, from Niger. Gregg Kofi’s recent performance on Italy's Rai 1 TV for the Epifania concert saw him singing with a 35 piece orchestra. His appearance along with an array of world music and Italian artists was the highlight of this holiday TV special. This album, “Rock 'n' Roll And UFOs”, is an anthology of music from Gregg Kofi Browns career and contains previous unreleased songs, remixes and demos with many guest musicians and artists such as Sting guitarist Dominic Miller, Bomb da Bass, Osibisa, The cast of the Who's Tommy, The Chimes Pauline Henry, the Who's former keyboard guru John Rabbit Bundrick and Seal guitarist Gus Isidore. The album is a companion to Gregg Kofi Brown's autobiography of the same name which covers his early career in Los Angeles and London. From his first pro tour with Joe Cocker and Eric Burdon to close encounters of a third kind in a California desert and his adventures touring the world with African rock pioneers Osibisa. His journey includes starring in hit west end productions in London, recording and touring with infamous rock bands like Hanoi Rocks and The Members.